A study conducted by the Center for Immigration Studies (CIS) found that the majority of the more than 1.5 million foreign nationals entering the country every year use about 57 percent more food stamps than the average native born American household. 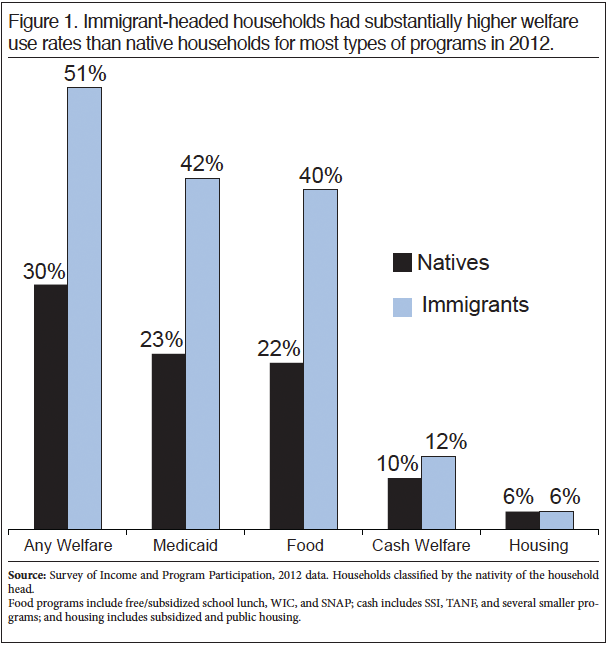 Overall, immigrant households consume 33 percent more cash welfare than American citizen households and 44 percent more in Medicaid dollars. This straining of public services by a booming 44 million foreign born population translates to the average immigrant household costing American taxpayers $6,234 in federal welfare. Breitbart reported: “President Trump’s administration is set to roll out a plan in the next month that bars foreign nationals who need government welfare to live from resettling in the United States, an effort aimed at saving American taxpayers billions. Since February, Breitbart News has reported how the Trump administration has weighed its options in enforcing an existing law whereby foreign nationals seeking to legally immigrate to the country would need to prove that they will not become drains on the American taxpayer. The rule seeks to reduce the burden of current mass legal immigration levels from primarily poor countries from which the U.S. imports more than 1.5 million mostly low-skilled foreign nationals every year. Officials with the Department of Homeland Security (DHS) say the Federal statutes that would give the Trump administration the authority to bar welfare-dependent foreigners from obtaining green cards is a long-standing law, noting that such rules are enforced in many other nations’ immigration systems across the globe. Australia, for example, has sought to lower the number of welfare-dependent legal immigrants entering the country every year by mandating that migrants meet a certain level of merit-based requirements. As Breitbart News noted, welfare use by households headed by legal and illegal immigrants in the U.S. is vastly more prevalent than that of households headed by native born Americans. Immigrant households consume 57 percent more food stamps than American citizen households, 33 percent more cash welfare, and 44 percent more in Medicaid dollars. This straining of public services by a booming 44 million foreign born population translates to the average immigrant household costing American taxpayers $6,234 in federal welfare. This seems like a perfect way for Trump to save millions/billions and use that money to build his border wall. Is that what he plans to do? We’re not sure. It almost sounds like he might be cutting the welfare for new immigrants and then redirecting the previously used funding for something else. Or maybe America just saves a few bucks and doesn’t waste it on something we may not need. Note From Barbara: The views and opinions expressed in this article are those of the authors and do not necessarily reflect the position of this website. Claims made in this piece are based on the author’s own opinion and not stated as evidence or fact.